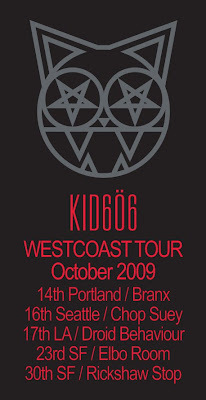 Kid606 will tour West Coast and you should really check him as the decades of experience in production and live sets make him one of the best DJ's you would have a chance to see and hear. He was in Poland a few weeks ago and I'm really disappointed I couldn't make to his show in Wrocław. To promote his tour, Kid606 released a fantastic mixtape which can be shortly described as electro industrial wonky trip through bass heavy landscapes. Kid606 is not afraid of experiments and his selection is always eclectic. This time stretching from Cardopusher's sub-bass and wonky stuff of Zomby, through grime / splatterbass sound of 16-bit or Kanji Kinetic, uk funk / garage tunes by Shark Slayer or DJ Blaqustarr to electro anthems of Green Velvet and Polygon Window. A perfect match for a perfect party.